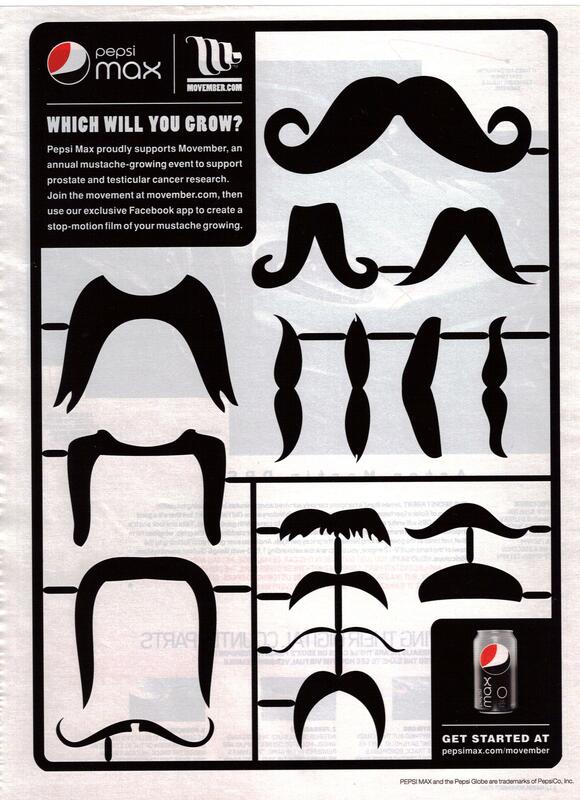 This is an ad for Pepsi Max and a mustache growing event to support research for prostate and testicular cancer and it was found in a men’s magazine. This ad is interestingly designed. It looks like a plastic sheet with plastic mustache shapes that could be popped off. The shapes are supposed to represent different possible mustaches that the viewer might grow, but many are shapes that don’t really grow naturally, but require styling, which few people have bothered to do for a long time. It does make for a striking, graphic image that grabs your attention. I can’t say that this ad gets me excited about or even interested in any of the things it’s advertising, but since I can’t grow a mustache, it’s not for me. Still, I like the visuals. This entry was posted on December 31, 2009 at 12:00 pm	and is filed under Advocacy, Food. Tagged: cancer, pepsi, pepsi-max, print-ad. You can follow any responses to this entry through the RSS 2.0 feed. You can leave a response, or trackback from your own site.